The time has come the iPad said, to show off many things: of pics and kings and moving text, and Alice doing things. Here is the best demonstration I’ve seen yet of the sheer fun of the iPad for things other than games. There is criticism out there that while the iPad may well be a ‘Kindle killer’ in terms of sales, it is not as good a device to actually read a book. Not just glance at for brief periods of time, or to scan read, but to REALLY read. Simply put, the electronic ink system used by the Kindle is easier on the eyes, and is easier to read outdoors. 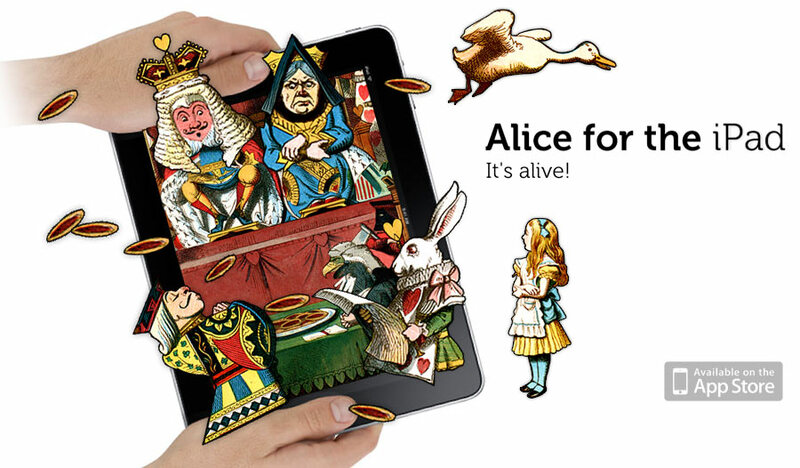 But then have a look at the newly-released Alice for iPad app that has been launched today. It does things the Kindle could not dream of doing in its present state. Taking as its source the illustrations from the original Alice in Wonderland book, the developers Atomic Antelope apply 21st Century programming magic to make an already lively text lift up a level or two in playfulness. Shake the iPad and make the Mad Hatter madder, slosh around the Pool of Tears, play croquet with a flamingo, or tilt the iPad to make Alice grow and shrink, like you have a ‘Drink This’ game command at your disposal. All up there are 52 pages in the Alice for iPad app, containing 20 animated scenes. The Alice for iPad is showing in the Australian App Store now, but of course cannot be purchased yet as Australia doesn’t start selling the iPad until late April. It doesn’t show at all yet on the App store accessed via the iPhone. There is what looks like an Australian price for the app, which is $11.99. As well as the paid app there is a free ‘Lite’ version, though until I download the app I cannot tell you yet the difference between the two versions.